Here it is! My favorite month! Well, not sure how good this one will be as it marks my 30th birthday, but I can still enjoy these last few days of my 20s! I realized I really don't have much patriotic decor so I decided to whip up something inexpensive and quick. Thanks to Martha Stewart, I came up with this centerpiece to festify (yes I made that one up) the dining room. I printed out the fans from her craft majesty's website, attached them to cookie sticks, and glued a ribbon bow in the center. I filled a vase with red and white gemstones (you can grab at any craft store). 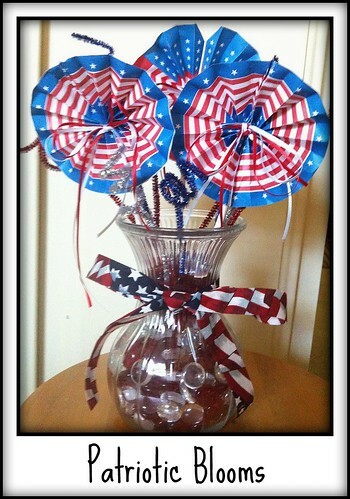 The fans can stand straight in the stones, and well as red, white, and blue pipe cleaners with curled ends.